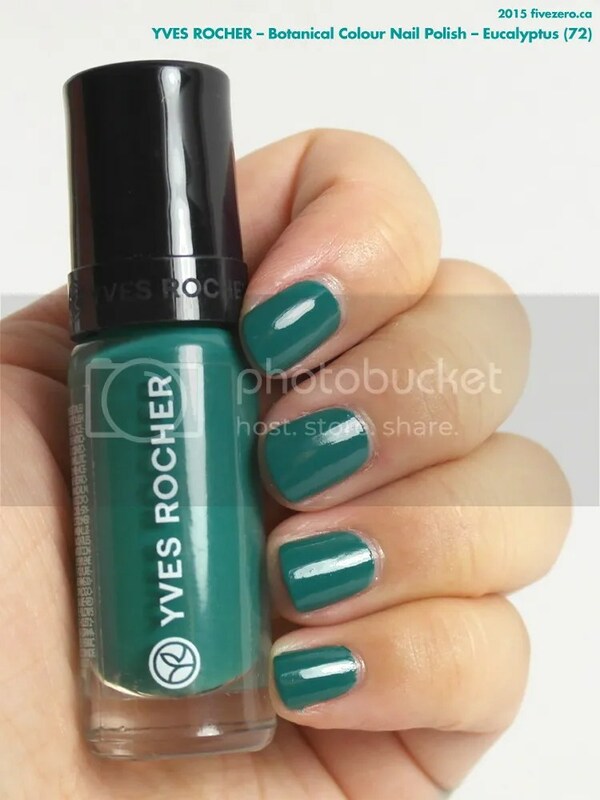 First off, I want to apologize for making a boo-boo on my previous Yves Rocher review of their new Gel Effect Lacquer. I mistakenly put down the pricing information for today’s polish, instead of for the Gel Effect Lacquer. The mistake has been fixed in the original review! Today I am reviewing the first of two polishes I bought from Yves Rocher’s updated nail polish line, Botanical Colour Nail Polish (this is still under the Couleurs Nature line, like the older product, but it’s not stated on the product label, so I’m omitting it from the name of the product). Vibrant colors, inspired by the infinite richness of the botanical world… The Botanical Colour Nail Polishes are formulated with Elemi resin for an optimum shine, coverage and lasting in one single stroke! For those who are unfamiliar with Elemi resin, as I was myself, it is apparently resin from the elemi tree, native to the Philippines. The resin is used for making lacquers and inks. Eucalyptus (72) is an intense pine green cream. Its subtle teal undertones make it a little more unique than your typical green creams. The polish applies amazingly! I almost drooled on myself while applying this color. I actually think it’s better than the much more expensive Gel Effect Lacquer that Yves Rocher released at the same time. The brush is also a wide, rounded paddle, similar to Dior’s, and I love this shape. I usually hate a wide brush, but the rounded end really does it for me. It’s brilliant. The only difficulty I have is using it to paint my pinkie nails, which are quite small. I have to tilt the brush and use a tiny bit of the brush edge for them. Two coats was perfect. Love. The polish also dries to a smooth, glossy sheen. Just a word of warning, however: the pigmentation on this particular shade is very high, and it stains the nails fairly easily. For the price (because you know Yves Rocher is always running those 50% off or 2-for-1 sales! ), it’s a no-brainer, even at the smaller 5 mL bottle size. I have already ordered a few additional colors (Aqua Blue, Iridescent Anthracite, and Pink Sherbet), and I’m already dying to get more! I mean, seriously, I paid CA$3.50 for Eucalyptus! That’s not even 50% off and I’m so happy with it. My review of Violet Blue, the other polish I ordered, will be up tomorrow! I love unique nail colors. This is really pretty. It totally does remind me of eucalyptus! Oh man! I NEED this formula! Is the range of colours fairly extensive? I’ll have to check on YR site. LOL I was mortified when I saw what I did. Maybe I need to hire a copy editor 😀 Or just, you know, double check stuff. There are a lot of colors! Nothing crazy, as you’d expect, but I was intrigued by several. I was putting a bunch of polishes into my shopping cart until I realized I probably didn’t want to spend $50 on YR nail polish in one go. Oooh these are still on sale at 45%, so $3.30 each! An impressive assortment of shades, actually! I do find the colour swatches on YR to be iffy, so I’ll have to stop by the store to check them out in person. The swatches can be a little too dark online and even in the brochure. I know the lipstick swatches are fairly pointless! Also, question: what’s a good base to prevent staining? Yeah I have Butter London nail foundation which is a beige colour but I do experience faster chipping with it. I guess you can’t have both! I love my Orly Bonder for my base coat but it’s not good for preventing staining. The green that i’ve been looking for! Oh geez, I just have to admire this by far for now. Ticked on my wish list! If this would be of help for your base coat problems..
Aw, is YR not available in your country? Isn’t it?! I love it!